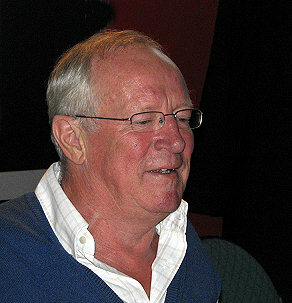 Earlier tonight (Thursday, 19 Feb. 2009) I attended a special engagement with British journalist, Robert Fisk, who writes for The Independent, followed by his talk to an auditorium packed to the maximum, with 678 people attending at Concordia University‘s Sir George Williams campus. The special engagement was hosted by Concordia’s student newspaper, The Link in its offices (see The Link’s interview with Fisk from 17 Feb. 2009) and was attended by numerous student journalists. Fisk repeated almost all of his comments an hour after the engagement, in the auditorium. He is amazingly consistent, as if following a set script that he can repeat almost word for word. Fisk promises to be one in a series of high profile speakers to visit Concordia over the next weeks and months: the previous night Spike Lee spoke in the same auditorium, and we can look forward to visits by Naomi Klein, Ward Churchill, and Noam Chomsky. With any luck, I will be able to report on each of those events, with especial interest in Churchill. Numerous organizations came together to organize this event, for which Fisk received no payment and which allowed people to enter on the basis of no donations, or for free. Among the organizations listed were: the Montreal Citizen Forum, Montreal Serai, Coalition for Justice and Peace in Palestine, Social Justice Committee, Palestinian & Jewish Unity (PAJU), Solidarity for Palestinian Human Rights (SPHR), Independent Jewish Voices – Montreal, CKUT FM, Concordia’s Department of Journalism, and Concordia’s School of Community and Public Affairs, and with an introduction provided by Échec à la guerre. Fisk is a charming and easy going person who seems to feel at home among strangers, and so his encounter with students flowed smoothly, with few inhibitions on either side, and while it was an amiable and agreeable atmosphere, there was really little agreement. Many of the students were particularly interested in issues of independent journalism, alternative information networks, blogging, and counter-lobbies, and Fisk essentially disappointed them on each of these fronts. Fisk’s persistent points were that one needs a “proper” newspaper, people have to pay for the news (putting it for free on the Internet has severely damaged the budget of The Independent), and deep readers are needed. Fisk seemed to have limitless scorn for both cable television news, the Internet, and blogs in particular; he claimed to not use the Internet at all, nor e-mail. One student pointed out how some blogs have been especially successful, and Fisk’s retort was, “Yes, but you can’t work for a blog.” How does a blog pay for the travel of the correspondent, for airline tickets, hotels, etc.? On the whole, a strong generational gap seemed to divide him from the students, as well as a different conception of how news is reported: the students seemed to prefer large, widespread, international collaborative networks with numerous bloggers in situ, while Fisk seems to prefer the lone and intrepid foreign correspondent who dances across the globe from war zone to war zone. I left the room thinking that I might have been happier had I just heard the students speaking among themselves. The subject of any kind of boycott of Israel was not mentioned by Fisk during his encounter with students nor during his address in the auditorium (it may have followed in final questions from the audience, but I exited about 10 minutes before the event was scheduled to end). Fisk is by no means charmed by Obama, and flatly says he will change nothing in the Middle East. Not only did he note, as I did here, that Obama made a pact with AIPAC, but that when he went to Israel he spent over 24 hours with his Israeli hosts, and then met for a mere 45 minutes with Palestinians. Fisk also quoted some of Obama’s noteworthy fluff statements, that say little or nothing at all, but are meant to convey a sense of serious purpose and optimism, without any goal or vision of reality. Fisk struck me as a man who can maintain intense focus, within an individual article. Most of his articles have always struck me as having something penetrating and revealing to offer. What I did not realize is that, outside of a given article, and ranging across a wide array of information, Fisk begins to lose focus considerably. To put it bluntly, he lacks a vision that can bring all the bits and pieces together to form a coherent analytical framework, a theory, or a philosophy. He has elements of all of these, but he has not found a way to gather them and make them work together. No wonder that he ended his address on a note of complete despair, confessing to a lack of any hope or idea for any possible solution. The Internet has been to Islamic radicals what the printing press was to European nationalism (a point I have made in my own publications concerning indigenous resurgence); yet, we are to ignore the Internet. We lack historical knowledge, we need to see the common patterns, the repetition, the previous bases, and so Fisk makes a statistical comparison between the present number of U.S. troops in Muslim nations and the number of Crusaders in Muslim areas in the 12th century. Yet, he objects to anyone who speaks of Israeli “apartheid,” because then we lose sight of the particulars, and we get a world crowded with metaphors and parallels. We should use history…but then not really. My general impression of Fisk’s politics is that in some instances he can sound as a liberal democrat, and in other instances as an angrier social democrat. Despite the images that some have conjured up of an extremist Fisk (who is scornful, even contemptuous toward Hamas and Hezbollah), he is probably the left’s middle ground, much like Obama is the right’s middle ground. There are many middle grounds of course, and none of them are actually in the middle of everything, nor especially in the middle of anything as we are all in the middle of different choices and tendencies. Even “the extremist” is a myth. When I started as a journalist […] you report football matches, you report on public inquiries into new motorways that cut through green areas, and you give time and space in your article to each side. […] But the Middle East is not a football match, and it’s not a public inquiry into something that will benefit the community, it’s a massive bloody tragedy. And it doesn’t mean we take sides in the war, but we must take a moral side…. The idea of a journalist is not to be a machine that goes in and spews out stuff where you give 50 per cent to each side. We’re human beings. We’re sent out there to be the nerve endings of our newspaper. […] Our job is to tell it how it is. Not to report on a football match. If you were reporting the slave trade in the 18th century, would you give equal time to the slave ship captain? No. You’d be talking to the slaves. If you were present at the liberation of a Nazi extermination camp, would you give equal time to the SS spokesman? No. You would not, you’d be talking to the survivors and looking at the dead. When I was in Jerusalem in the summer of 2000, a Palestinian suicide bomber walked in to an Israeli restaurant and killed 16 people, most of them children. I didn’t give equal time to the Islamic Jihad spokesperson…. “Kenney says some Canadian Arab groups express hatred toward Jews: Should not expect government funding, immigration minister says,” CBC News, 17 February 2009. “Canada becomes Israel,” Yves Engler, The Electronic Intifada, 12 February 2009. “Gaza: Critique on Canadian media coverage,” Interview with Derrick O’Keefe, editor of rabble.ca, by Stefan Christoff, Tadamon! 10 February 2009. “Obama the imperialist: Change? In foreign policy, hardly. The new president is in the classic liberal interventionist mould,” Richard Seymour, The Guardian, 27 January 2009. Thank for getting the audio up so quickly. I agree with your comments (as you know) and was still wondering late last night about some of the things he said, among others the quote from Winston Churchill and Fisk’s exclamation of “he got it right”. What did he get right? I will have to go back and listen to it again. And on the point of Hamas, while it is true they made a political gamble by not choosing to continue the cease-fire, what Fisk failed to mention is that there wasn’t a cease-fire to renew. Oh yes, there was the “cease-fire” where the Palestinians of Gaza were supposed to role over and accept the occupation. In the end I felt at times that he was trying too hard to keep things balanced, 50/50, as if it were a football match. I will be curious to see today if his French presentations are different or whether I will be hearing the same script again. Many thanks for the visit and the commentary Kiven. I was just thinking that for him to come up with such a neat and fast line, “I am neutral and unbiased in favour of the suffering,” that has to be the result of many years of accusations, defenses, debates, etc. It’s too much of a diamond for it not to have been coal. However, I think some of the pressure and heat that the coal was subjected to lingers in his mind, and has affected him. So I like how you observe that in the end, in person anyway, there was still some of the 50/50 reporting, and he quotes some dubious characters like Lawrence of Arabia. Moreover, he praises how the British were planning for the occupation of Germany, how civil servants would march in with the troops, and what genius that was — without knowing it he borders on praise for the Human Terrain System (he might not know about it). So it seems that his biggest complaint about the American invasion of Iraq, or one of his major complaints, is that the Americans did not “plan” for what to do after the occupation. Given his other statements, surely the only thing he would have wanted them to “plan” to do was not to invade in the first place, and having chosen to invade, to get out immediately. Good luck with today, I look forward to hearing more. What I believe Fisk’s main point is, throughout all his interviews, debates, speeches and otherwise, is that we as readers must not let ourselves be fooled by our own beliefs and how we perceive the world to be. He wants us to take guard against eloquently written articles that temp us, when not properly informed about the situation or subject, to sway from one idea to the next, rendering us uncertain and incapable of taking an assertive stance in the right direction, or on the other hand, maintaining a corrupt point of view because some journalist thinks the same way we do about the war. In other words, he wants us to protect ourselves from overly opinionated journalists, or like Nassim Nicholas Taleb likes to call them in his new book The Black Swan: “industrial producers of the distortion”. Now there is a lot more to say on this subject but I’m not going to get into right now. Not all journalists are like that, but more and more of them are. On the boycott issue, I don’t believe it was mentioned by anybody, nor did Fisk mention it, because boycotting Israel, in my opinion, is completely unrealistic. What he focused on were the people that are affected by this war, not on a political level or an economical one, but on a moral one. He believes that journalists should pay more attention to the people who suffer and that this attention should be divided on each ‘side’ of those who are affected. There are always people who suffer on both sides. Journalists should describe these suffering using their true emotions, not some squabble babble romantic overview of the situation to sell papers (like Fisk mentions the journalists did in the Globe and mail, in the National Post and others), but to remind us that the people who are suffering are real and their plight must be acknowledged by nothing more then our own emotions when reading these articles. In a way, he wants us to become revolutionaries of our own mind. Constantly questioning others and more importantly ourselves. Well put, Grasshopper-especially the last line of your post. Ghandi once said that to seek enlightenment you must first look within: “Be the change you want to see in the world”. In other words, before you can advocate for the freedom of others, you must first free your own mind of the prejudices you hold. That’s one possible interpretation of the meaning of that statement, not the best one in my view, since it is largely taken out of the colonial context in which Gandhi worked and militated against. It really means you have to decolonize your own mind — prejudice is a bit too amorphous, and it sidesteps the idea that you cannot advocate freedom while your own mind remains imprisoned by the dominant order. Many thanks for visiting and commenting Keegan, and my apologies for the long time it took to have your post appear here. That certainly is another way of seeing what Fisk does. I suppose that I saw a bit too much swaying within his own presentation, as if he were not conscious of the contradictions because he never tried to address them. Having listened to him, there is really nothing we can do at all, it is all hopeless. Inaction is realistic, because at least it is sure to achieve its goal, which is nothing at all. Sorry, I cannot agree. Just a quick note on Fisk’s talk at UdeM (I did not attend his talk at UQAM). Tired and clearly rushed, Fisk presented a greatly abridged version of his Concordia talk. After about 10-15 minutes he decided to end and take questions from the audience. Unlike the Concordia crowd, the UdeM audience was more subdued; there was no applause after many his bigger statements as was the case at Concordia. Overall the discussion tended to focus more on Lebanon. A revealing moment for me was the question put to Fisk at the end by the moderator Gilles Bibeau as to why Fisk believed there is no such thing as a “just war”. After seeming to acknowledge that WWII might have been a case for a “just war”, Fisk stated plainly and emphatically that any violence in which thousands and hundreds of thousands of people die, as was the case in Dresden, nullifies any question of there being any possibility of a “just war”. Very interesting notes there Kiven, much appreciated. One thing is for certain, Fisk works very hard. He has a punishing schedule, and it would take a lot out of anyone. I am still thinking about his 50/50 coverage issue, and specifically the comment that one does not interview the captain of the slave ship, just the slaves and survivors. I am not sure most of us in anthropology would agree with that. We might not give sympathetic coverage to the captain, or suggest that his position is equivalent to that of the slaves, but we would certainly want to hear what he says, if only to better destroy it. Compared to an ethnographer in other ways, he defeats the stereotype some of us have of a journalist who drops in, rushes an assessment, types up an article, and takes off, whereas we think of our stays as prolonged and without rush. Having lived in Lebanon for about 30 years, I think Fisk would see anthropologists in those terms. I’m with Keegan. In one of his talks, Fisk quoted Amira Hass saying “Our job is to monitor the centers of power. To challenge authority, especially when they want to go to war. Especially when they’re going to kill people and tell lies to do it.” I tend to agree. Most Media is in the service of corporations and governments, not really doing the “last watchdog of democracy” thing they’re supposed to. I never read an objective journalist, so might as well have them sway to the people. No harm in that. I’ve had enough of the apologetics for big machines. I agree with you on the ship’s captain bit. That’s why I translate Israeli News broadcasts in my spare time. Understanding the very ill mentality of Israel will help avoiding it’s pitfalls, in future societies. Fisk is talking like a man who’s seen too much. In the aforementioned talk, he criticizes journalists who were in the field, but never got out of the hotel room. Bloggers tend to do this. By his comments, it’s obvious that he has an information gap about the internet’s potential in making revenue, but I think there’s a valid point about centers of information, as long as it’s plural and offers a broad range of opinion (seeing as “objective reporting” is an oxymoron). “lacks a vision that can bring all the bits and pieces together to form a coherent analytical framework, a theory, or a philosophy.” Again I have to disagree- Fisk has a very clear philosophy: “we must take a moral side”. He is professionally and in essence a story teller, who takes a moral side. He’s not a theorist and though we’d expect him to be, I doubt anyone who looks at so many details can really clear his mind enough to crystalize a theory. Lastly, Fisk may not be saying hope, but he sure as hell is acting on it. He could have been collecting a pension, right now, instead he continues to dedicate his life to the bettering of human lives. I wasn’t there for the talk but the general question of “journalist” versus “blogger” is interesting. It seems a bit like one of those false oppositions we so easily get caught in when discussing technology. I understand what seems to be his argument for a financial investment in a person whose job it is to “know” the news. However, I would argue that the curent crop of mainstream journalists, simply, aren’t providing it– for the reasons you cite, Max. Limited involvement with the people and places. Having been in Tanzania in ’94, when the Rwandan genocide occurred. I remember how incorrectly the Nairobi stringer (quickly flown to Kigali) reported the whole situation. He simply had no knowledge or understanding of Rwanda. Currently, one would be hard-pressed to find a journalist from any of the major news groups who is giving us much of an accurate picture of Zimbabwe. They all prefer to focus on the “crazy African despot” that is Mugabe and don’t look much beyond that. As I mentioned in a blog post, the best information is coming from a Zimbabwean journalist blogger. I have been wondering for a couple of weeks now, how he manages to support himself. It doesn’t seem to me that we should be picking between the two but finding a way to take the best of both and forming a new hybrid–“knowledge” experts with infrastructural support would be ideal. Tali, I am not sure one can really disagree that there are numerous contradictions in Fisk’s presentation as I outlined, and more of which you can hear in the audio record of his presentation. Contradictions are not a major sin, but his contradictions appear to come from his inability to bring together the very points that he raises, as if he has details and no big picture. I think this is one of the serious differences between a journalist and an academic. It doesn’t mean I don’t like the work that Fisk does, but it means I know much better now of when to take what he says with a dose of salt. I fully understand the moral point of view, and I was not disagreeing with that or criticizing it. Why would I anyway? It is the same kind of point of view one finds on this blog. Pam, I think that as time passes we will see more of a correspondence between the citizen journalist/blogger and the category of “native anthropologist,” in terms of what they will share in common. I expect the quality of “news” to improve as long as we can figure out how to effectively aggregate it. The meta-blogging blog will become more relevant, to encapsulate and summarize the wealth of citizen journalist blog posts that are produced each day worldwide. In addition, many if not most mainstream media are cutting back on their foreign coverage, so this will further highlight the value of bloggers in place already. I understand that Fisk is worried about his position and how these developments may work to decentre the position that he occupies. “Yes, but you can’t work for a blog.” How does a blog pay for the travel of the correspondent, for airline tickets, hotels, etc.? AS much as I admire Fisk for his actual reporting, he should stop making statements about things he admittedly knows nothing. There are many “blogs” now that employ reporters, or make enough advertising revenue to allow the blogger(s) to go to the story. Talking Points Memo (TPM), is one such example; Marshall took his personal maundering to a new level and now employs several people. TPM won a Polk award for crissakes! Fisk is revealing his own stodgy biases and displaying an alarming lack of awareness about what is going on. Great points Kenneth, I wish I could have made them to him directly. Thanks Tali, but now everyone is going to say that I am jihadist, lol.